An all in 1, perfect protoboard! 1.75" square, 52 Pin TSSOP 0.65 mm footprint to pads, a SOIC Footprint, AND a Short Lead 32 Pin TSSOP 0.5 mm, going to pads. Wire up to 52 pin 0.65 mm pitch TSSOP style parts, or, multiple 8 pin amplifiers on this little monster. Make decent guitar effects, all kinds of amplifiers, or antenna circuits. The short lead 32 pin 0.5 mm footprint has pads to make wiring the chips easier. Proto-Chip SMD wire pads for discrete parts(0603 to 1206 size) and wiring from backside also. Ground Plane on back. Power/GND traces around board. Build almost any type of circuit using this board, as it supports the 3 most popular pitches for SMD parts. And discrete parts fit on the Proto-Chip pads, or unused leads, be creative! 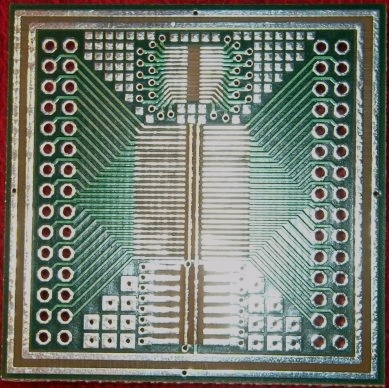 The micro pads for soldering any kind of discrete part to board, like SOT devices, can be used how you see fit. Use 28-30 gauge wire for the holes. See the soldering article for honing some soldering skills, and the basic tools. There is a mechanical drawing on the TSSOP Panel that shows more dimensions, see the button links on the main page, under the Mechanical Drawings.